BAX protein plays a key role in the mitochondria-mediated apoptosis. However, it remains unclear by what mechanism BAX is triggered to initiate apoptosis. Here, we reveal the mechanism using electron spin resonance (ESR) techniques. An inactive BAX monomer was found to exhibit conformational heterogeneity and exist at equilibrium in two conformations, one of which has never been reported. 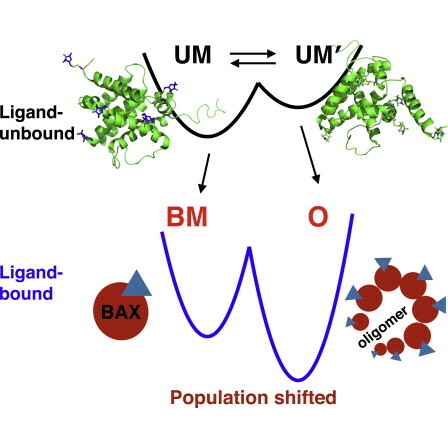 We show that upon apoptotic stimulus by BH3-only peptides, BAX can be induced to convert into either a ligand-bound monomer or an oligomer through a conformational selection mechanism. The kinetics of reaction is studied by means of time-resolved ESR, allowing a direct in situ observation for the transformation of BAX from the native to the bound states. In vitro mitochondrial assays provide further discrimination between the proposed BAX states, thereby revealing a population-shift allosteric mechanism in the process. BAX’s apoptotic function is shown to critically depend on excursions between different structural conformations.